Sahruddin, who is also the Bukit Kepong assemblyman, said the most important thing is to ensure that the people continue enjoying the progress and development as planned. “With the help of all YBs and our friends, Insya Allah (God willing) we will be able to bring Johor forward,” he told reporters at the PPBM office here. Also present were Johor PPBM chairman Osman Sapian – who Sahruddin succeeded as menteri besar – Johor Amanah chairman Aminolhuda Hassan, Johor PKR deputy chairman Jimmy Puah Wee Tse and Johor DAP chairman Liew Chin Tong. Sahruddin was sworn in as the 17th menteri besar at Istana Bukit Serene in Johor Bahru this morning. 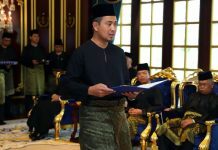 He said he would adhere to the advice of Sultan Ibrahim Sultan Iskandar in carrying out his new responsibilities. 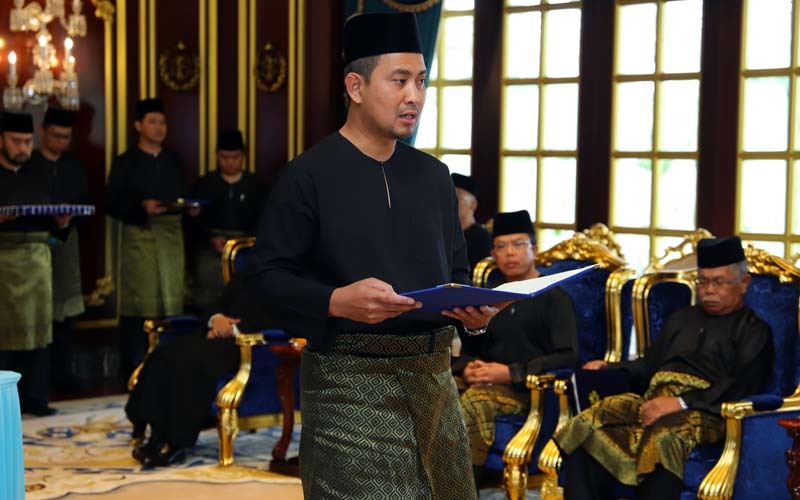 “Tuanku also wants to make sure that if we are elected as the leaders, be the leaders who are trustworthy and with integrity to ensure the fate of the people will be better protected,” he said. Sahruddin also thanked Osman for being the major driver in the development of the state. “Many plans have been implemented by Datuk Osman and I will continue with the planned agenda,” he said. Asked about the new line-up of the state executive council, he said he would expedite the appointment within 14 days. 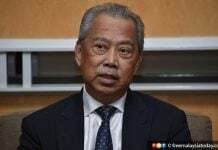 Meanwhile, PPBM president Muhyiddin Yassin hoped the state administration will run smoothly and focus on developing the state following the transition of leadership. He thanked Sultan Ibrahim for consenting to the appointment of Sahruddin as the new menteri besar, as proposed by the Pakatan Harapan (PH) leadership. Muhyiddin also expressed his appreciation to Prime Minister and PH chairman Dr Mahathir Mohamad for his guidance and support and full confidence in Johor PH to come to a consensus in the leadership transition.